An attempt to answer the question of Necessary Elements which states "In order for the process of scientific change to be possible, the mosaic must necessarily contain at least one element. Scientific change is impossible in an empty mosaic." 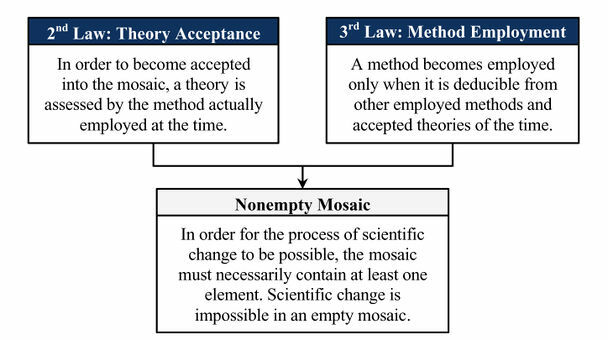 Non-Empty Mosaic theorem was formulated by Hakob Barseghyan in 2015.1 It is currently accepted by Scientonomy community as the best available theory on the subject. Non-Empty Mosaic theorem (Barseghyan-2015) is an attempt to answer the following question: How can the process of scientific change get started? What are the minimum necessary requirements for science? See Necessary Elements for more details. This page was last modified on 11 February 2017, at 16:53.